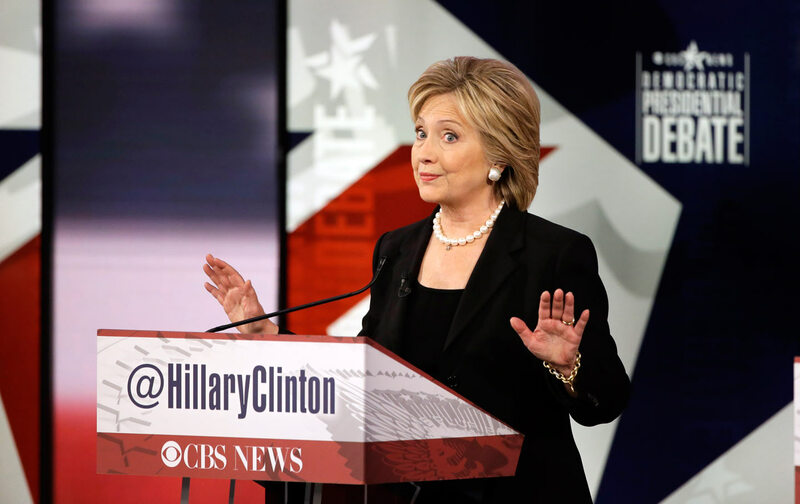 Her answers at the Des Moines debate revealed a fluency with complicated global challenges. But can Democrats forgive her Iraq vote? Drake University’s Sheslow Auditorium shined with the colors of France Saturday night as a subdued audience filed in for the second Democratic debate. Campuses usually rock on debate nights, but two of the campaigns had canceled their traditional “visibility” events, where supporters amass and cheer their candidates for the many news cameras, to honor the hundreds of victims of Friday night’s cruel terror attacks. A few Martin O’Malley supporters stood and yelled along the line where the audience filed in, a discordant sight and sound as the sun set and the auditorium’s tricolor lit the night. Inside, the debate unfolded in the shadow of the events in Paris, and it revealed the Hillary Clinton paradox: the former first lady, senator, and secretary of state clearly knows more about the world, in more complexity, than either Senator Bernie Sanders or O’Malley. Her answers, to sometimes pointed, critical questions, revealed a fluency in the complicated global challenge of defeating ISIS, suddenly front and center in the presidential campaign, at least for now. Most post-debate polls showed she was overwhelmingly judged the winner Saturday night. Yet despite her formidable experience and judgment, as a New York senator Clinton made the wrong decision about the Iraq war in 2002—a decision Sanders blamed for contributing to the rise of ISIS. As secretary of state, she backed the overthrow of Libya’s Muammar Qaddafi and supporting the Syrian rebels; both nations are now in chaos. Thus one of her best campaign assets is also her greatest liability, especially within the anti-war precincts of the Democratic base. Will her Iraq vote be disqualifying in 2016, as it was for many Democrats in 2008? This time around, she has admitted her vote was a mistake, and on Saturday night, she did it again. Clinton also resisted efforts to get her to take a hawkish stand on ISIS in the wake of the Paris attack. “It cannot be America’s fight,” she said, in an exchange that drew her criticism from The New Yorker’s Amy Davidson, who suggested that she understated the case for American leadership to fight ISIS in an effort to not seem like a war-monger. Clinton likewise resisted CBS moderator John Dickerson’s fervent efforts to get her to blame the attacks on “radical Islam,” as did Sanders and O’Malley. “That would be like saying we weren’t at war with Nazis, because we were afraid to offend some Germans who may have been members of the Nazi Party but weren’t violent themselves,” Rubio said on ABC’s This Week. I’m honestly not sure what Florida’s junior senator was talking about. Speaking of the JV: Dickerson confronted Clinton about President Obama’s contention last year that ISIS was the “JV,” and asked her if she felt she and the administration shared blame for underestimating ISIS. Clinton refused to bash her boss and focused on the way the ISIS threat has metastasized unexpectedly. But she did note her support for arming Syrian rebels four years ago—a difference with Obama—and defended her role in advocating that the United States back the Arab-states coalition that overthrew Qaddafi. Sanders won points on the left for referring to the US role in overthrowing democratically elected governments in Iran, Guatemala, and Allende’s Chile, among others, from the 1950s into the 1970s. And he’s right to note that such bloody meddling led to global resentment that for decades the United States routinely propped up or helped to restore dictatorships around the world. But the comparison was a little bit off, given the context. The removal of elected leaders in Iran, Guatemala and Chile can’t be compared to opposing Qaddafi or Bashar al-Assad (or even Saddam Hussein)—all brutal dictators intent on oppressing their own people and trying to dominate their neighbors, whose reign led to righteous resistance that has too often melded with Islamic extremism and terror. Complicating matters is the fact that Clinton was a skeptic of “regime change” in Egypt; she worried that deposing Hosni Mubarak would only lead to another form of authoritarianism, or an Islamist government. She was technically right, though her skepticism about the forces behind the Arab Spring didn’t win her friends among pro-democracy supporters. In the end, I don’t think the debate resulted in Sanders or O’Malley demonstrating the textured knowledge or strategic vision that might convince voters he’s the man to tackle the threat of ISIS. Time’s Michael Scherer (an old friend and colleague, by way of full disclosure) said Clinton won the debate by moving to “pull rank” over her two rivals, which seemed a slightly churlish way to characterize the genuinely superior experience—which is not the same as judgment—she possesses. Scherer categorized her debate approach as “condescending” to Sanders and O’Malley, which seemed a little diminishing. It’s hard to imagine a man criticized as “condescending” for referring to his own experience. But Scherer agrees with most observers that Clinton had another good night. Still, it’s not clear if she reassured voters concerned about her comparative hawkish streak. If she is sincere about her commitment to put US support behind a global coalition to take on ISIS—which ought to involve pressure on allies, most notably Saudi Arabia, who fund terror, a subject that didn’t come up Saturday night—she is clearly the candidate with the most detailed knowledge and experience about the allies and foes who will be mobilized in that effort. It’s likely war skeptics were left feeling that Clinton is the most knowledgeable about the conflicts we face, which is good, and still the most interventionist by instinct, which is less so.